The ip88-3ad is a combined analogue and AES digital input/output BLADE. It handles input and output, each with 8 stereo channels, 16 mono channels, or any combination totaling 16 discrete channels. Half of these are analogue, the other half AES digital. 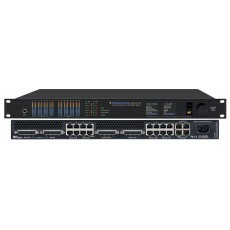 The ip88-3ad converts each hardware physical input -- audio or logic -- to a data stream on the network, and converts data streams to hardware digital outputs. It handles analogue and digital input and output, each with eight stereo channels, 16 mono channels, or any combination totaling 16 discrete channels. Half are analogue and other half are AES digital. It also provides twelve channels of universal logic (GPIO). All signals are routable anywhere on the network. 8 stereo channels, 16 mono channels, or any combination totaling 16 discrete channels (half analogue, half AES digital).